With thoughts of relief and recovery in our minds, Tokyo hoopers have raised money for the Red Cross and collected food to help Peace Boat provide hot meals in Ishinomaki. Now join the Japan hooping community to create a video to raise money for local charities. Let’s show off our talents and reach out to hoopers around the world with a unique and fun fundraiser. 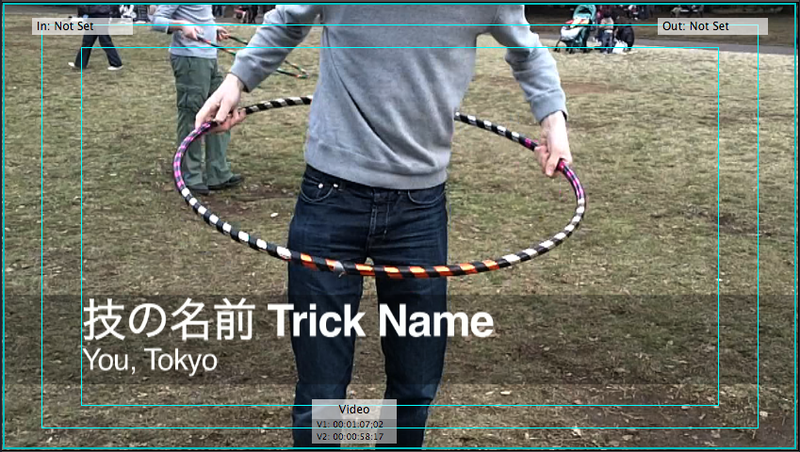 The Japan Tricks Showcase will be a tutorial video featuring Japan-based hoopers and their original hoop tricks. The video will show each trick at regular speed and then in slo-mo with the trick name and your name and city on screen. We’ll put it online and ask hoopers around the world to watch it and donate to charities in Japan. You can invent your own original trick! Any sort of hoop trick is great – simple, silly, complicated, poses, circus, burlesque – anything goes. Every hooper in Japan is invited to participate, and you can do your trick solo or with a partner or group. The only “must” is that your trick’s name is inspired by Japan: sakura, kawaii, neko-chan, sushi. etc. Filming will take 15-30 minutes per trick. Bring your hoop and wear your favorite clothes or costume. If you cannot make it to one of the scheduled shoots, please make an appointment with me for a special session. Or submit your own HD footage directly (ask for specs) for editing. To participate, please e-mail spinmatsuri@gmail.com the info below and I’ll get back to you with a confirmation and further details. Start thinking of a trick and I’ll see you in front of the camera soon!